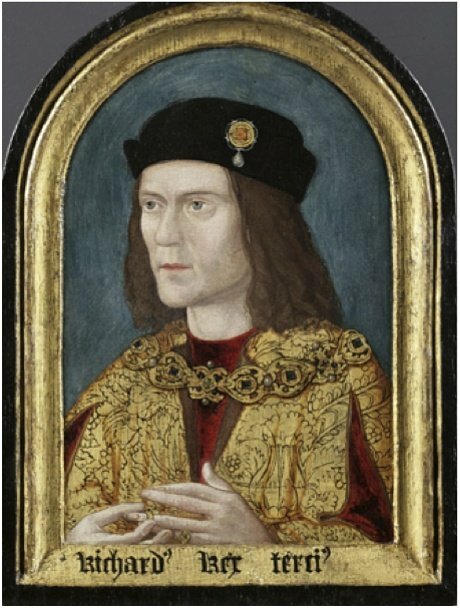 Early in 2014, it was shown that a body found in a construction site in Leicester, England was that of King Richard III. I thought I might bring up some interesting details about the research that followed up this amazing discovery, since so many people arrive at my site by searching for my family tree on the British monarchy. The research in question concerns the DNA of Richard III and yields questions about the British monarchy DNA. Now Richard III left no descendants, and so testing for the Y-chromosome was done on other descendants of Richard’s second great grandfather, Edward III. Of the living descendants who were tested, all are in the line of the fifth Duke of Beaufort, Henry Somerset. The problems come from the observation that their Y-DNA does not match that of Richard III. Here enters John of Gaunt, who was brother to Richard’s great grandfather, Edmund, Duke of York. As well, the current British Royal Family is in the line of John of Gaunt as well. So, Somerset’s current descendants, Richard III and the current Royals should share very similar Y-DNA. Somewhere, the father of one of the children was not the husband of the mother, aka a “non-paternal event”. The question is, where did it happen? It could have been between John of Gaunt and Richard III. That might upset the historical legitimacy of Richard’s kingship; but that’s a bit of a moot point now. If John of Gaunt were not the biological son of Edward III, then the legitimacy of the Tudor family might have some issues. And since the current British Royal Family has ties with the Tudors, that could upset the apple-cart, as it were. But there are places in this chain where the non-paternal event could lie and everything still be fine for the Royals. For example, the non-paternal event could fall somewhere in the line of Edmund, second Duke of Somerset. In this case, all is fine and dandy for the current Royal Family. If you are interested in following through on this, check out the article in the Telegraph. It shows the relevant family tree and highlights the key points where problems could arise. To discover any real issues, a good deal of testing would have to be done. Is that likely? Probably not. Apparently, it’s lucky that there was no DNA testing back in the 14th century.